Turning casino players into winners is Winner Casino's distinctive contribution. The website is very easy to navigate. It's also pleasant to view in terms of aesthetics. The presence of live dealers makes the casino more fun. No download is required for the games on the website. They can be played in instant mode. The promotios section is probably the most exciting feature, since it shows a a whole bunch of deals. In fact, it would be worthwhile to compare the deals with what other casinos have to offer. The free sign-up bonus already distinguishes the casino from the rest. It grants €/£30 for free. No deposit is required with the deal. The welcome bonus is also quite generous. The players can receive a Winner Casino Bonus deal offer up to €/£350. On the second deposit, the players can receive up to €/£300. The casino also hosts a Super Saver Monday as well as a Free Spins Tuesday. The latter offer applies to the slots games. It allows the player to play the games without making a money contribution. Out of all the highlighted deals, the comp point collection offer is worth mentioning as well. Every wager gets rewarded with comp points at the casino. Such points can be redeemed for real money. Lastly, the refer-a-friend program should likewise be welcome by those players who would like to introduce others to the casino. There are a whole lot of deposit options. They would include; Visa, MasterCard, Neteller, Ukash, PaySafeCard, Skrill, Click2Pay, ClickandBuy, Eco Card and FundSend. In order to star playing the games, the player must go through a brief registration process. This process can be initiated by clicking on the „join now" button at the top of the page. There's not a whole lot of information that is required from the player. Only the most basic info is requested. The residents of certain countries won't be able to play on the website. These countries are mentioned in the terms and conditions. Here is the list; Caricom Territories, Afghanistan, Antigua and Barbuda, Bulgaria, Cuba, Cyprus, Estonia, France and Its Territories, Hongkong, Iran, Iraq, Israel, Kahnawake, Libya, Macau, Netherlands Antilles, Republic of Serbia, Sudan, Syria, The Philippines, Turkey, United States and Its Territories, Bahamas, Barbados, Belize, Dominicana, Grenada, Guyana, Haiti, Jamaica, Montserrat, Saint Kitts and Nevis, Saint Lucia, Saint Vincent and the Grenadines, Suriname and Trinidad and Tobago. The website is available to players who speak variou languages including; English, Spanish, Norwegian, Portugese, Polish, German, and several others. 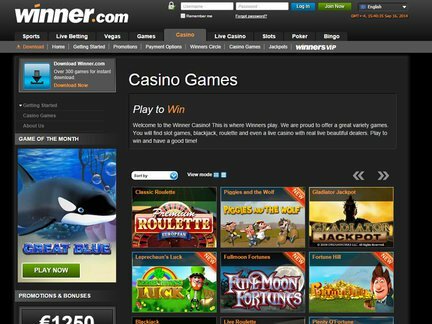 The popular Winner Casino games are shown here; Jack and the Beanstalk, Gonzo's Quest, Starburst, Robin Hood, Twin Spin, Glow, The Wish Master, Elements of the Awakening, Dead or Alive, Thrill Spin, Piggy Riches and Lights. As many as 300 games are available to players. These games fall under the following categories; Vegas Games, Slots, Arcade Games, Table Games, Card Games, Scratchcards and Jackpots. The new game category features titles like; Spinata Grande, Steam Tower, King of Slots, Gonzo's Quest, Glow, Twin Spin, Jack and the Beanstalk, Angel or Devil and Rubiks Riches. The slots are very excitging too! The list of slots features; Fruit Shop, Hot Gems, Jungle Games, Reel Rush, Cops N Bandits, Wild Games, Pink Panther, and a few others. The players have spotted some problems with withdrawals and the bonuses. This casino gets a very low rating from users, which indicates the customer support isn't doing a great job when it comes to outreach. The casino needs to pay a lot more attention to constructive criticism. Otherwise, it will be seen as an untrustworthy venue. The exciting customer support can be contacted by phone, email, live chat and regular mail. Winner Casino is operated by Zirconium Gaming Limited. This company is registered in Antigua & Barbuda. Their licensing authority provides proof of legal operations. The casino has been around for quite awhile. It's been established in 2009. I hate to play in an online casino which is known for an unresponsive customer support service. The staff appears to have a hard time with resolving complaints. This is unfortunate, since the game offer is actually really good. Unfortunately, I cannot recommend this place in good conscience. Things needs to improve before the casiino will be ready to receive more traffic.